The following letter to the editor was published in The Observer on Thursday, October 3, 2013. Holtz made a remarkable comment last year: “College football’s better when Notre Dame’s on top, where they arenow.” He insists, “Notre Dame isn’t better; college football is better.” If you listen to Holtz provide commentary on Notre Dame, it’s obvious that he sets Notre Dame as the standard for excellence. Historically, our standards have been unique. In 2001, the LA Times wrote, “For all its football success, Notre Dame has not paid market price for coaches.” Supposedly, under Fr. 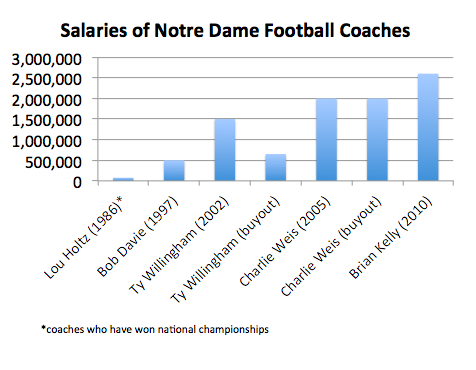 Hesburgh, no coach was paid more than the highest-paid professor. But we changed. Ty Willingham was hired that year for $1.5 million. He was fired in 2004. When asked about what went wrong, he said, “We didn’t win football games.” There’s only one thing: Win. That’s it. That’s the bottom line. Win. After the firing, Professor Ralph McInerny wrote in an article titled “The Firing Irish,” “The point of an athletic contest is to win, but how one wins and loses is crucial for players and fans alike.” The sad thing about the Willingham firing is that winning at all costs now seems paramount. Fans are by definition fanatic, but a university administration should take a longer view. Holtz may have been the last coach who worked for Notre Dame. Now the coach works for wins, and “that’s it.” We’re not the standard anymore. We’re just like everyone else. We can’t “win the right way” if we don’t hire and fire the right way. (Weis’ buyout may cost more than 250 times Holtz’ssalary, by the way.) We hired Kelly to do what he’s doing. He’s free to cut the alma mater and to interview with the Eagles. We don’t offer a “prize” now; we offer a job. Cutting the alma mater after losses is just getting what we paid for. Having the student managers paint the team’s helmets before each game. (before 1990’s- 2011). Having the team process from the Basilica to the stadium before each game. (1920‘s – 2011). Having the team sing the alma mater after every home football game. (2006 – 2011). Having the Notre Dame Band provide all music for the home games. (1887 – 2011).